A morning without a good cup of coffee is, to me, a grim proposition. Caffeine is, of course, the primary necessity, but I’ve grown accustomed to the luxury of choosing from a variety of interesting, flavorful single-origin arabica beans and have steadily built up the better part of a kitchen counter full of equipment (burr grinder, water heater, french press, Aeropress, etc.) for preparing it. In short, I’ve been inching my way down the path towards coffee geekdom. Fortunately, Columbus is a pretty good place to be for anyone with such inclinations. For that, and before we get to the meat of this post, we should give due respect to Stauf’s. Started in 1988, Stauf’s blazed the path for the quality single-origin bean in town. Nobody’s done more to promote education in and availability of quality coffee than Stauf’s owner, Mark Swanson, and many of the more recent roasters to set up shop in town are graduates of their operation. And set up they have, including Cafe Brioso, Yeah Me Too, Back Room Coffee Roasters, Crimson Cup, Impero, and, undoubtedly more. The latest, somewhat out-of-left-field participant in the roasting game is Thunderkiss. If you’re a fan of the hyper-resourceful underdog, this is your guy. Jason Valentine, Thunderkiss’s proprietor, literally operates out of his garage. And, thanks to his inventiveness and a keen eye for eBay finds, Jason seems to have set up a dollar’s worth of operation for a dime. The roaster, which he snagged from a coffee house Houston, is seamlessly installed, beautifully maintained, and resides in what might be the one of the tidiest versions ever of a structure built to house cars. 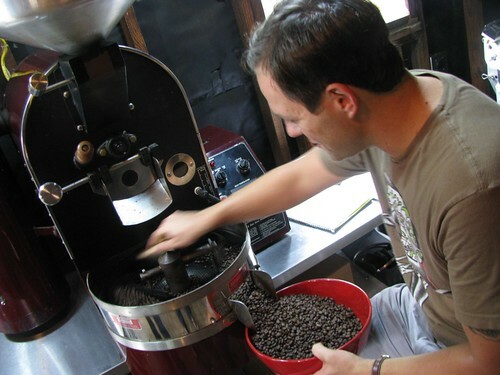 In 5lb batches, Jason roasts his meticulously sourced raw beans, while making careful notes on time, terminal roasting temperature, and a variety of other variables. Jason speaks easily and at length about ‘3rd wave’ coffee roasters, so to the best of my abilities I’ll try to explain what this is and how we got there: the 1st wave was the consumption of coffee in any form, 2nd was increased concern about the bean itself (when people first were concerned with the distinction between robusta and arabica) and rudimentary progress in the understanding of roasting, and the 3rd wave’s focus is on detailed concerns about single-origin sourcing and a deep emphasis on roasting to allow the myriad natural flavors of the beans to come through in the final product. In no small part, this relies on eschewing the perceived over-roasting favored by 2nd wave purveyors (think Starbucks), which often masks subtle flavors with a somewhat burnt, smoky taste. As you listen to these 3rd wave preoccupations – origin (terroir), subtleties in roasting, bean resting times – and the descriptions of the flavors that result, one might be tempted to make comparisons to wine culture. In fact, at least one 3rd wave roaster I’ve spoken with has suggested that from a biochemical standpoint there are far more distinct flavor possibilities to be found in coffee than in wine. Jason is impressively conversant in this lingo, and has obviously put tremendous effort into achieving a high level of mastery of the roasting process. It shows in the end product. He’s currently offering 4 different beans – Guatemalan Zemoch, Peruvian Cajamarca, Rwandan Western Province, and an Ethiopian Sidama. For the coffee-geek-curious, I’d encourage you to get one bag each of the Guatemala and Rwanda, and taste them side by side. Compare the punchy, earthy flavors of the Zemoch to the subtle, smooth, and almost sweet qualities of the Western Province. 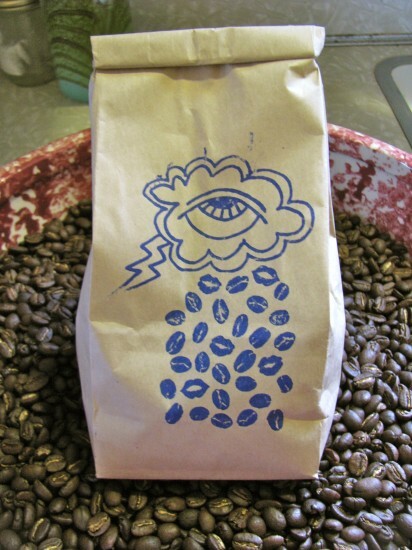 Thunderkiss Coffee is currently carried at Fresh Street, and is sold in 6oz bags. Jason’s plans include the possible opening of a coffee shop and a bike coffee-vending operation. ← Who cares about condiments? We do! Do you know of any foreign coffee tours? I am looking for an aromatic coffee adventure. Mid-life crisis came before my mid- life, and I am taking well advantage of it! 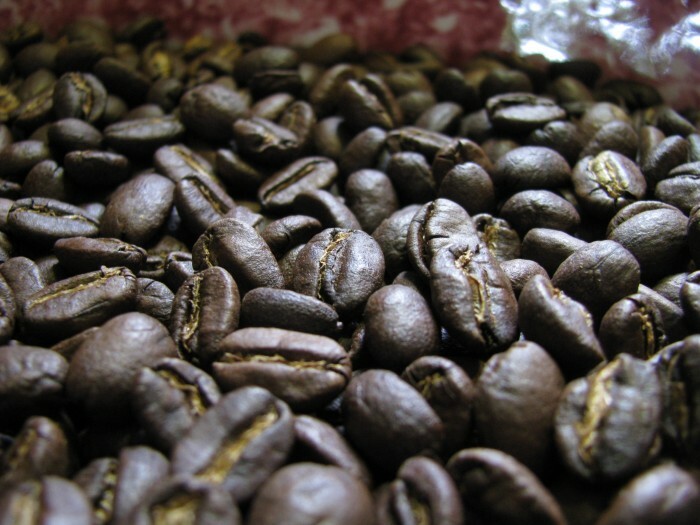 I know that you can tour coffee plantations in coffee growing countries eg: http://www.anywherecostarica.com/tours/coffee (also Puerto Rica, Hawaii) but I don’t know of any tours that are all about coffee or visit numerous plantations.